Big Brother Canada 2 - Adel says Kenny's a hunk. Ika says Kenny is ugly with his pimple a$$ back! Big Brother Spoilers > Big Brother Canada > Season 2 > Big Brother Canada 2 – Adel says Kenny’s a hunk. Ika says Kenny is ugly with his pimple a$$ back! 2:15pm Sabrina is really hung over and complaining about not feeling well. She tries to get into the diary room numerous times and Big Brother keeps denying her access. She tries to sleep in the havenot room and Big Brother keeps waking her up. 2:20pm In the kitchen – Adel and Ika are talking about how they need a name, some thing better than “The Misfits”. Ika says we need a good name. If we pick a good name we will be the name. We need something good. Adel says what about “The DEMONS”. Adel and Ika head up to the main bathroom. Adel says he is trying to get JOn and Arlie to spread rumors about Andrew & Kenny to put the target on them. Adel tells Ika to stick with the girls and pump them up saying that the girls need to win this for Canada.. Girl Power! Adel says you can’t cut up Sarah. Adel says I am going to try and get Andrew and Jon to stir up sh*t with the girls. Adel says that Kenny is good looking he’s a hunk. Ika says Kenny is ugly with his pimple a$$ back! Heather comes in for a second and the conversation ends. When she leaves, Ika says if I win the veto should I take her off? Adel says I don’t know, we got to think about it. Ika and Adel continue to talk. Adel says if we win HOH next week we just need to put up who we want and hope the house votes out the right person. Adel tells Ika that he is putting it in Arlie and Jon’s head that your not that good to take the target off of you. Ika says okay good. Ika leaves to go bond with the girls. Ika runs into Sabrina and tells her that they need to stick together .. we are all we have. We can’t let them break us up. 2:40pm – 2:45pm Up in the HOH room – Ika, Sabrina, Rachelle, Kenny, Jon and Neda are talking about random things. Neda comments on how she really does think the area downstairs under the stairs is a secret door. Big Brother cuts the feeds. 3pm – 3:40pm Big Brother blocks the live feeds… When the live feeds return Sabrina, Allison, Ika, Kenny and Andrew are sitting on the living room couch. The living room TV’s show that the POV Competition is TODAY! Sabrina is complaining about how she hit her head on the havenot ceiling and needs meds for her headache but Big Brother won’t let her in the diary room. Jon gets into the diary room and Sabrina asks him to ask them for meds. Jon comes out and gives meds to Sabrina. She asks about if she needs to see them about a concussion. Jon is complaining about his leg hurting and thinks he has nerve damage. 4:15pm In the HOH room – Sabrina is with IKA and Rachelle getting ready for the POV competition. Sabrina is doing her make up and tells them that she used to be model back in high school. She says her boyfriend at the time got jealous of the attention she was getting. Sabrina narrates what she’s doing as she does her own makeup. She then does Rachelle’s make up. 4:20p – 4:30pm In the living room – Allison says that her a$$ tingles when she’s nervous. She says its tingling because she’s nervous about the POV. Andrew asks so your a$$ tingles when your near me? ALLISON says no not now .. ..when I first met you my A$$ TINGLED. Andrew says I actually thought I was cast as the d*uche bag … but I wasn’t ..Kyle was. Heather says yeah he played that role well. 4:50pm At the bar in the kitchen – Neda is helping Arlie take the nail polish of his toenails. 4:55pm IN the havenot room – Adel and Heather are trying to nap but big brother wakes them up. Adel tells Heather that she has to try hard for the Veto. He gets up because he if he lays there he will fall asleep again. He tells Heather to not fall asleep again either because if she gets the house punished she will put a bigger target on her back. 5:15pm In the kitchen – Ika tells Allison she should come up to the HOH room to visit. Ika asks where Heather is? Allison asks if she’s up in the HOH room? Ika says no, I was just up there. Ika says I kind of feel bad. I did try to evict her a few days ago. Allison says I think she’s doing well coping well. They head up to the HOH room. Outside the HOH room door – Ika tells Allison “Either way I am voting for you to stay ..either way ..I don’t want you to go.. because I don’t have anyone.” Allison says I appreciate that I really do… that’s a very good decision. In the HOH room – Neda, Allison, Arlie, Ika watch Sabrina do Rachelle’s makeup. 5:30pm – 5:40pm In the living room – Kenny is drinking coffee and spills some on the circle couch. He jumps up and grabs windex from the kitchen. He sprays the stain, rubs it for a second with a cloth and then sits on it. He says this is how I clean. Sarah comments how she is shocked there aren’t more self evictions. Adel says if this was $500 G’s can you imagine how much more competitive this would be. Kenny says he thinks by season 5 they’ll bump up the prize money. They talk about who would come back for all-stars. Ika says: “If I win the veto should I take her off?” not, I am not taking her off. Yes you’re right.. i was doing a million things at once and they talk so fast some times..
is ika playing? i hope she wins, or someone else who wouldn’t change it, as i dont want ika or adel to go up (or anyone who would go against the boys). i hope it stays the same and allison goes. she’s a strong number for the boys and her getting into a showmance with andrew so fast is just stupid gameplay. Noone fuc**ed with me in high school (sound went out) then Sabrina says, after that everybody knew not to fu*k with you. I want Ika gone so bad. Hairdresser (with a police record). Trash, living on Canada’s dime. How do u know if Ika is living on Canada’s dime? That’s a bit harsh. She lives in Thornhill,Ontario and has never lived in the ghetto. I don’t like Ika but no need to say horrible things about her and stoop to her level. Seriously she is a pure douche bag with a few terrible values she find acceptable norms. But living on Canada’s dime? Where the F*ck did that come from fool. She works and has a husband that I presume works. Better explain what your talking about and back it up! Do you know what her police record is for? If Ika wins and uses the POV on Heather, then Adel is going to be put up. So I hope she doesn’t use it on heather and just votes to evict Allison. Allison leaving will be better for the Adel,Ika,Arlie crew. Allison is beyond disappointing, a showmance? Really girl? Neda and Jon need to start winning stuff because I don’t think j Sabrina can control them and that would be nice to watch. who is playing in the Veto??? Sabrina, shut up with your modeling past, nobody cares! She is Delusional. Has anyone seen these modelling pics? To be blunt I just don’t believe her. Not only does she lie about everything, but models have to work with other people and Sabrina had proven herself incapable of that. I think like you, I actually think she is an insecure pathological liar. I still don’t get how ANYBODY are comparing notes, she is making stuff up since day two! I still think the best move is for Ika to leave. REASONING: Allison is another vote for the guys right now and I actually think her staying another week may allow her to pass through for a while. Ika is with Adel, but unfortunately Ika has no friends in this house that can help her get her back on top. Arlie on the other hand does, and I think if Adel loses Kyle-Paul and now Ika, he is FORCED to team up with Arlie. The new alliance may take effect this time next week if Ika is gone from the game. I also think Ika isn’t very smart when it comes to what she wants to do. She has a lot of correct claims when it comes to her opponents but yet she still trusts the ones that she thinks are untrustworthy (See Sabrina). It’s one thing to be nice to Sabrina so that you aren’t Sabrina’s target, it’s another thing to blindly believe that she will come to your aid when you claim that she is closer to the guys. who are playing in the POV????? I heard Sarah and Kenny. The week Sabrina is nominated and evicted will be the best week of my life. Drama self destructing an stereotyping Italian batshit crazy girl will go home an make me laugh. 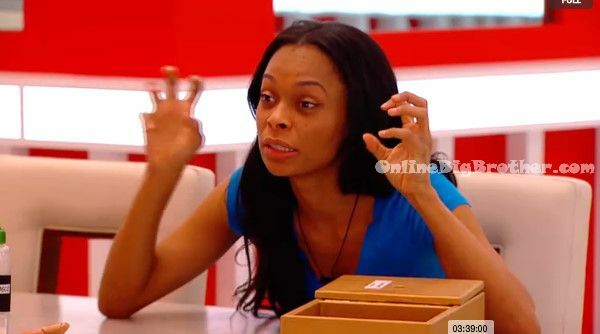 She’s go to the jury if she ever gets voted out no home like ET! Hate Brina all you want OBB fans I’m telling you her douche bag game is king up til now. Either Adel or ika will win POV because they are the only 2 not hungover. The others should have known better and not gotten so drunk last night. I watched after dark for the first time last night and it was a joke. Great impression they give about Canadians. Thanks dawg! I appreciate ur updates. I’m disappointed with Allison tho but I think she should stay for another week or 2 and put Andrew instead to shaken up the house a bit. I just want to say thank you so much for this site. I love it!! I really, really, really like Allison as a person. But, she is definitely someone who should have remained watching from the couch. I hope that its a something to 0 vote to get rid of her. So that Andrew/Sabrina/Kenny/Sarah all look STUPID later for getting rid of someone on their side. If not, hopefully the Allison vs. Heather thing stays the same which continues to divide up the house. Thatll be exciting to watch. And yes, Deli! PLEASE USE YOUR ‘POWER’ NEXT WEEK TO GET RID OF ANDREW. Just a simple question – Sabrina said she’s Jewish and doesn’t eat pork. People on this forum have erroneously called her Italian. Her background is Middle-Eastern? Anyone. I don’t care JFTR but I was reading earlier posts about the whole Iranian, Canadian, and lack of ethnic diversity discussion and wanted clarification if anyone has it. There is a small jewish community in Italy. so sabrina and rachelle are both jewish from european descent? what is it with loudmouth bully girls with a jewish background ruining bb seasons? is the sabrina casting productions sick joke on us all knowing how annoying amanda was last usa season? And Sabrina says pass the pork chops I have only had four. Why she is so emotional . Thanks Simon and Dawg for all your hard work on this site. And thanks to all the people that post comments here. We can agree with some and disagree with others and that is what makes OnlineBigBrother the best Big Brother Canada site around. Do you guys think Jon would take anybody off the block if he wins POV? I don’t think so. I have a feeling he’s still playing it safe and using it would endanger his potential alliance. Honestly, who here thinks a member of the first 5 will get evicted before jury? Allison is so dull with her fake spray tan, and Andrew reminds me of the fat kid who lost a ton of weight now he thinks he’s “the man” lol. As for Adel, even though i like him he seems kind of naive and prone to making silly mistakes(like not distancing himself with Paul). Even though the special power he has is great, does not guarantee that he can win POV comps, he still has to win it which i am not sure he can do.